LeBron comes face-to-face anew with his eager Pinoy fans! 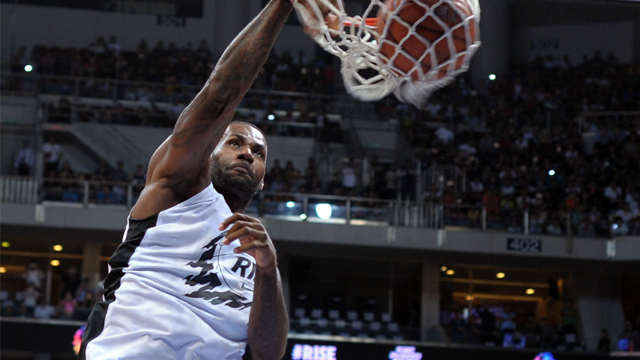 It was indeed a kingly return for LeBron James in his second visit to Philippines. The four-time NBA Most Valuable Player and two-time champion setting foot again on Philippine soil was, in a way, comparable to his homecoming to Cleveland last season. Minus all the drama, LeBron had one goal in mind coming back to our country; if for his hometown he aimed to bring home that elusive first trophy, he came back here to mentor the chosen streetballers of the Nike Rise basketball program. The event kicked off with former national team and now Nike Rise Team head coach Chot Reyes unveiling his team's final 12 members. Wasting no time, the newly declared Nike Rise Team members, along with several Nike athletes—most of which were from the PBA—warmed up for the exhibition game, which pitted two mixed squads, the Black and White teams. In typical exhibition match fashion, things started kind of slow in the first half, with only the Nike Rise Team members pushing the tempo. LeBron, meanwhile, watched the game keenly on the sidelines. The White team's Cliff Hodge was the only noticeably intense pro baller out there, true to his reputation in the PBA. Halftime saw a tightly contested three-point shootout, which was won by the sole female member of the Nike Rise Team, Kristine Cayabyab. Things then started heating up in the second half. What do you get when you have Thirdy Ravena, Hodge, Chris Ellis and Kobe Paras all on the same basketball court? A dazzling display of gravity-defying dunks. In the end, the LeBron-assisted Black team may not have trumped the White squad, to the score of 86-100, but the NBA icon managed to win many Filipino hearts with a successful stopover. Not to mention his parting words: "I love you guys, I love you." We love you too, 'Bron! Till we meet again!